As you scroll down the page you will find a list of all of our Single Elimination Tournament brackets. These are available in both blind draw and seeded formats. All of our brackets are available to print for free, and if you visit our store some of them are available on large 24" x 32" prints. 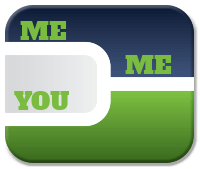 Most of our free brackets now have the capabilities of being customized. When you find and click on the bracket you need, you will be directed to a sample view page. There you will have two options. If you click "Customize this Bracket" the printable bracket will load with the option to edit the title and print. If you click the "print" button just the printable version will load. Below are two sample images, the one on the left has the generic title, the one on the right has been customized. Check out our Fillable Brackets if you want to edit the full bracket with live results. 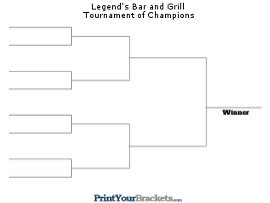 The Single Elimination brackets above are free to print. They have been divided into two different sections, one for "Seeded" and one for "Blind Draw". We also have Double Elimination Brackets and Triple Elimination Brackets available or you can check out all of the Types of Tournaments available. 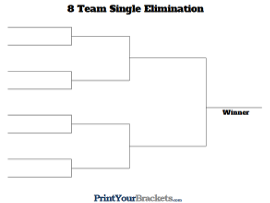 Single elimination tournaments are very simple to run. The above illustration and the comments below should help guide you through setting up and running your tournament. The bracket above is a 16 Team "Seeded" Single elimination bracket. The same idea is used for all Single Elimination brackets, not matter what the number of participants are. 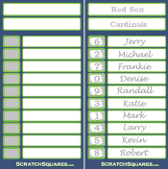 A: The letter "A" points to the "Seeds" of the tournament, if you have pre-ranked your participants based on strength or a season record you would put each team's name on the corresponding line. If you are printing a blind draw bracket these numbers will not appear on the bracket, but the rest of the bracket will be exactly the same. B: The letter "B" points to the order in which the games are to be played. 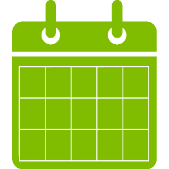 Simply start by playing the game labeled (1) and continue until all games are completed. In a single elimination tournament there is always 1 less game then there are participants in the tournament. The championship games on our Single Elimination brackets do not have the last game number listed. We have also created a cool little tool that will calculate the total Number of Games in a Tournament.